You’d like to build a web app but aren’t sure where to start. For every question you have, there’s two more you don’t even know to ask. You could use a trail guide for SaaS that can help you make informed decisions. Don’t wast days or weeks making the same mistakes I did. Let Starting & Sustaining be your trail guide. 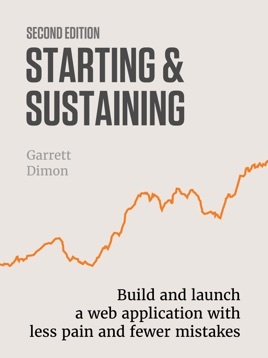 Starting & Sustaining is a system to help you with the logistics and operations of building, launching, and sustaining your own web application so you can save time and avoid the countless mistakes that I made. I spent eight years building, launching, and sustaining Sifter as a sole founder. Three of those years included medical issues, and I ultimately sold Sifter to focus on family and health. The process of selling Sifter gave me even more context and insight around both the good and bad decisions I made over the years. Starting & Sustaining is a convenient package of all the lessons I learned the hard way so you can make more informed decisions for your own business.